Ironwear®'s SwimVest™ was originally designed by Ironwear® for training olympic water polo players. The inside and outside of the vest are constructed of high strength soft woven mesh. 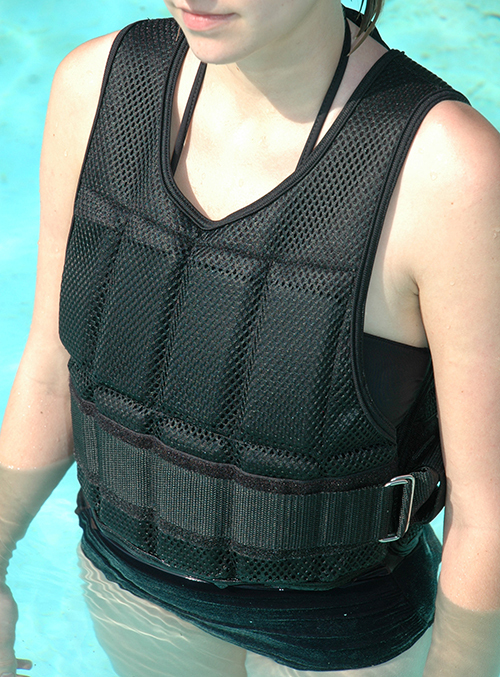 The large holes allow water to pass easily through the vest to minimize resistance of the water and to allow the vest to stay close to the swimmer's body. The vest has 20 mesh pockets, 10 in front and 10 in back, and can be adjusted from 1 to 11 pounds with Ironwear®'s 1/2 Pound Flex-Metal® weights. 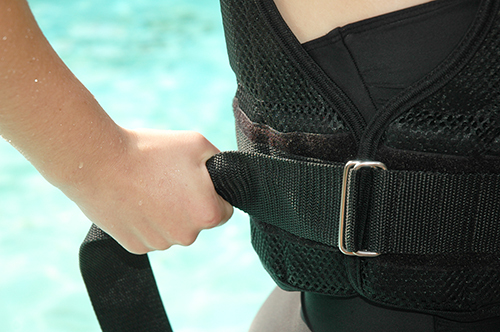 The SwimVest™ uses oversized stainless steel hardware to withstand high pool chlorine levels. 2-inch nylon webbing is used to secure the vest snugly so it does not move while training. The SwimVest™ is a professional training tool and should only be used under professional supervision.